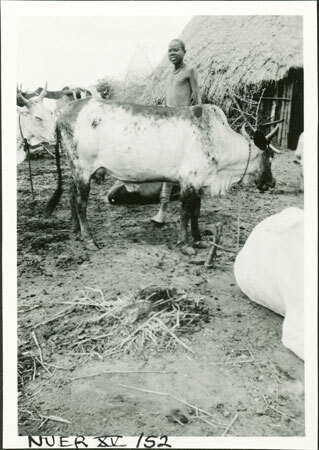 A portrait of a tethered cow standing in a kraal near a byre (luak) with a youth just beyond. Evans-Pritchard describes this animal as a bil cuor, which seems to refer to a combination of darker markings around top and sides (bil), and yet rather patchy in appearance (cuor). It is likely that this photo was taken in May 1935 after Evans-Pritchard had completed a survey of the Anuak. Note on print reverse ms pencil - "22 232 [female symbol] Akobo bil cuor" & print front border ms ink - "NUER XV/52"
Morton, Chris. "Nuer cow" Southern Sudan Project (in development). 03 Jan. 2006. Pitt Rivers Museum. <http://southernsudan.prm.ox.ac.uk/details/1998.355.726.2/>.